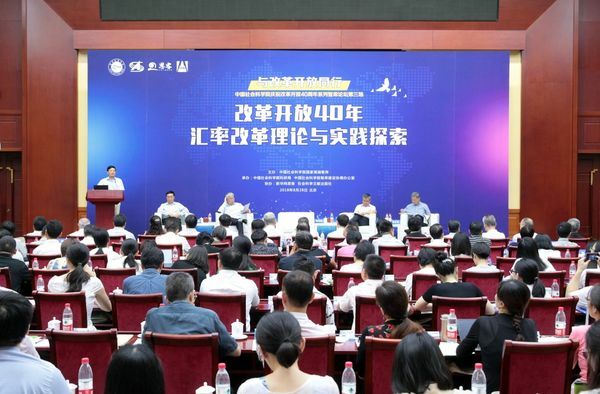 A forum on reforming the RMB exchange rate convened in Beijing in late August, the third of a series of forums organized by the Chinese Academy of Social Sciences (CASS) to mark the 40th anniversary of the Reform and Opening up. The exchange rate is one of the economic variables at the core of the macro economy, said Xie Fuzhan, CASS president and secretary of the leading Party members’ group of CASS, who added that deepening the reform of the RMB exchange rate formation mechanism has always been an important issue. Xie reviewed the backgrounds and measures of the three reforms of the RMB exchange rate mechanism carried out in 1994, 2005 and 2015. He summarized the effects of each, pointing out that the reforms have effectively promoted the opening up of the Chinese economy, furthered economic growth, created macroeconomic internal and external balance, improved the domestic capital market, resisted the impact of the external financial crisis, and accelerated the internationalization of the RMB. Through these reforms, China has accumulated valuable practical experience, Xie said. First, it is necessary to adhere to the direction of marketization reform. The reform of the RMB exchange rate formation mechanism has always followed this direction, and the government’s direct intervention has been gradually reduced. Except for special periods of major financial risks overseas, the impact of market supply and demand on the RMB exchange rate pricing mechanism has been gradually increasing. Second, it is important to stick to the autonomy of reform. Improving the reform and determining its approach, content and timing should always be based on China’s fundamental interests and realities, he said. It is also important to keep aware of the gradation of reform, Xie said. To improve the reform, we must flexibly handle its intensity and pace, fully consider the adaptability of economic entities, and promote it step by step in response to changes in the market. Having established a clear direction for reform, we must still be alert to the window of time, Xie continued, adding that the marketization reform of the exchange rate should be dynamically adjusted and allow for trial and error based on feedback. It is vital to keep the reform under control, Xie said. Exchange rate reform should be compatible with macromanagement, reduce the impact on the macro economy, prevent the excessive impact on foreign-oriented enterprises, and avoid major fluctuations in macro economy and finance. Yu Yongding, a CASS Member and former director of the Institute of World Economics and Politics (IWEP) at CASS, said that China’s previous policy on the exchange rate has been quite successful, maintaining its stability. In the face of new situations, serious consideration should be given to the feasibility of implementing a floating exchange rate for the RMB. CASS Member and former vice president Li Yang and IWEP director Zhang Yuyan said that the exchange rate is essential and extremely complicated, and it is not only an economic and financial issue, but also a political one. We must pay more attention to the RMB exchange rate formation mechanism than the level of the exchange rate. Li and Zhang advocated establishing a market mechanism that would allow the RMB to fully demonstrate its purchasing power, it being that the exchange rate formed under such a mechanism could guide us to effectively allocate resources globally. For the RMB exchange rate, the next step is to continue to deepen reform, including reform of the economic system, the financial system and the RMB micro-market structure.